Mother Dairy has introduced an expensive ice candy. Proverbial old wine in new bottle. What we have always eaten as Choco-Bar ice-cream. 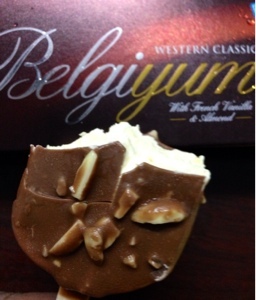 It claims that Belgian chocolate is used in it. How much? 10 grams in a tonne? Nobody will tell. At Rs.80/- a piece not worth it. Nut stuck out side with chocolate were old or tasted bad. Definitely not worth trying again.